Here are some facts about Christmas trees. Trees were first decorated to celebrate Christmas in 15th century Europe, although nobody really knows why. It may be that the evergreen tree symbolized eternal life. One of the most famous Christmas trees is in Rockefeller Plaza in New York, where a tree has been put up every year since 1933. It is usually a Norwegian Spruce, and can be up to 30 metres tall. 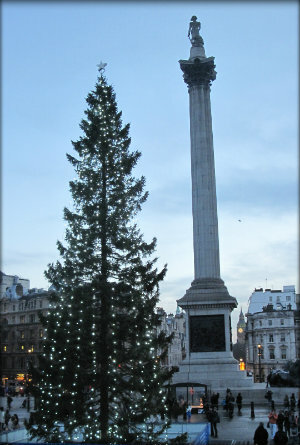 Other famous Christmas trees include the National Christmas tree in Washington, DC and the tree in Trafalgar Square, London. The tree in the Vatican in Rome features a life size nativity scene. President Pierce was the first US President to have a Christmas tree in the White House, in 1856. Apparently, President Roosevelt would not have a tree because of environmental concerns.In Europe, an estimated 50 to 60 million Christmas trees are sold each year. In the United States, about 35 million are sold and there are about 20,000 Christmas tree farms. Christmas trees are grown in all 50 of the United States, including Florida and Hawaii. At any one time, there are about 350 million trees being grown in the US. It usually takes between 6 and 10 years to grow a full sized Christmas tree. A tree in your home will need up to a litre of water each day. Artificial trees were invented in Germany during the 19th century. In the 1930s an American company used the same bristles for both its trees and its toilet brushes. Candles have been used to decorate trees since the 17th century. Thomas Edison’s assistant invented Christmas tree lights in 1882 and they were first mass produced in 1890. In 2011, a LEGO Christmas tree was displayed at St Pancras Station, London. The 10 metre high tree was designed by Duncan Titchmarsh and contained more than 400,000 LEGO bricks and weighed more than 3 tonnes.